New research by Santander has revealed parents across the UK with school age children, are willing to pay 15% more to live within the catchment area of their chosen school[i]. Many parents are making significant sacrifices to be near top performing establishments with 25% increasing their commuting costs, 20% downsizing, 24% taking on extra hours at work and 16% even moving to an area they didn’t like. Buyers at Reynard Mills by Notting Hill Genesis in Brentford, won’t need to make any compromises. Parents keen to move can choose from a selection of stunning new homes for private sale and Shared Ownership, close to some of the best performing schools in the London Borough of Hounslow, and with easy access to fast and convenient transport links into the centre of the capital. Located on a quiet residential road, between Ealing and Chiswick, residents at Reynard Mills have a selection of 104 schools and colleges to choose from within a five-mile radius of the development all rated Ofsted ‘Outstanding’[ii]. Nearer to home, parents have a choice of ten schools located just over a mile away; The Little School Daycare provides care for babies, toddlers and preschool children. Lionel Primary School and Fielding Primary School are all rated Oftsed ‘Outstanding’. For those students aged 16-18, there is a choice of 8 high schools located within three miles of home, including the third best school in the borough, Gunnersbury Catholic School. All of the homes at Reynard Mills boast a high-specification and intelligent design. The collection of three and four-bedroom houses have been thoughtfully designed to support busy modern families and feature fully-fitted kitchens with a range of integrated Siemens appliances and a separate utility room with WC. The dual aspect lounges and dining areas benefit from French doors opening onto the rear garden and patio. Bathrooms and en-suites are contemporary in style with white Roca sanitaryware and chrome fixtures and fittings. All of the properties enjoy access to generous communal gardens and landscaped play areas aiming to create a strong sense of community within the development. Come rain or shine, those residing at Reynard Mills can enjoy an abundance of outdoor and indoor activities in and around Brentford. Located just 0.9 miles away, Gunnersbury Park is suited for all seasons; whether exploring the park’s 186-acre ground, visiting Gunnersbury Museum or having a bite to eat at the park’s very own café, local residents will never be short of things to do. Also located close by is Boston Manor Park and Blondin Park, with the latter host to the popular annual community event, Brentford Festival. For shopaholics, Westfield Shepherd’s Bush is 20 minutes away by car, and is home to over 400 stylish stores including Aquascutum, French Connection and Cath Kidston. The trendy riverside gastropubs, restaurants and upmarket retail quarter of Richmond are also only a short drive away. Homes at Reynard Mills are available to purchase through Shared Ownership or private sale. The Shared Ownership scheme offers buyers the opportunity to buy a share of a home, between 25% and 75%, while paying a subsidised rent on the remaining share. Purchasers can also choose to buy additional shares on their property as and when they can afford to, right up to 100%. 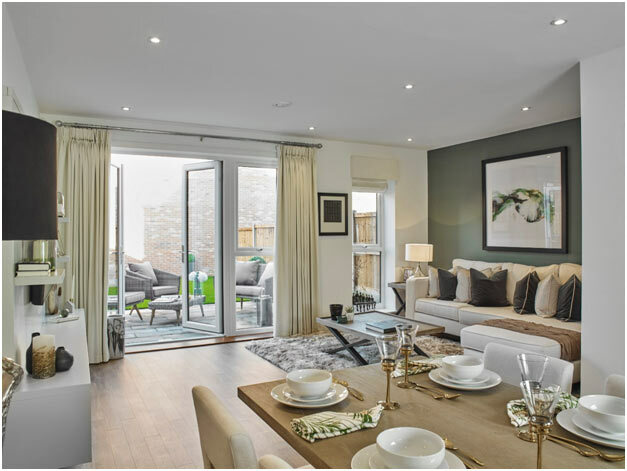 For private sale, prices for a three-bedroom home at Reynard Mills start from £750,000. Prices for a one bedroom Shared Ownership apartment start from £108,750 for a 30% share of £362,500. For more information visit www.nhgsales.com or to book your viewing call 020 3603 8675.